These questions are all choices I’ve been faced with in the last few weeks, and seem pretty standard life decisions that we’d all recognise. Whilst none of them would result in the end of the world if I got them wrong, it saves time, energy and money if I can get ’em right in the first place. And over the years, I’ve found I’m in with a much better chance of doing that if I harness my logic AND my intuition, and get them working together. So how do you go about that? Well, first off, you use your logic to establish what your choices are, and then run them past your intuition, using one of the following techniques. You can’t get much more straightforward than this one. All you have to do is move your mind into neutral, pose the question, and then sense or see in your mind’s eye whether a tick or cross comes up. What do I mean by moving your mind into neutral? In essence, disconnect from any emotion around the issue under decision – for a few moments, drop any concerns or desires you may have around it. Any prejudices you might have, such as ‘this brand’s better than that brand’, will get in the way of your intuition. If you can’t find neutral, try being curious: ‘I wonder which possibility is going to turn out to be the choice I need to make?’ And then look for/sense your tick or your cross. I used this technique for my recent purchase of a paper shredder. You won’t believe just how confusing buying a paper shredder is – or maybe it’s just me. But because so much of my work is highly confidential, a decent paper shredder is a big deal in my life! Having had two die on me in quick succession, I didn’t trust my logic any longer when it came to deciding which to buy. So I scoped a few out on Amazon, and then let loose with the tick/cross method on the resulting list. After getting out of my own way and disconnecting from my doubt about my ability to get it right this time, I simply looked at the image of each shredder, and said in my head, “Tick or cross?” and I’d see-sense one or the other. Surprisingly, the one that got the tick wasn’t the one that would normally have been at the top of my list. It wasn’t the most expensive, and it wasn’t the cheapest, either. (It’s certainly the heaviest – I can hardly move the thing …). It was delivered a week ago, and so far, it hasn’t died. A week isn’t much of a challenge, even in my office, so I’ll let you know what happens! 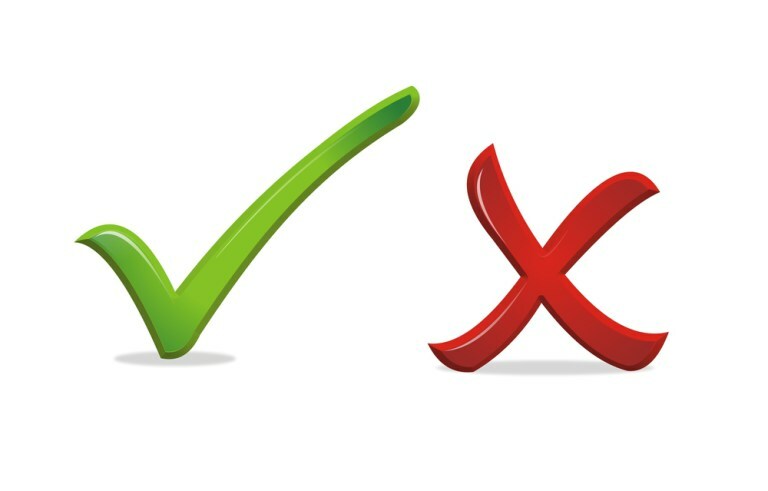 Sometimes, if you’ve given yourself a wide range of choices, you’ll end up with more than one tick. In this case, size really does matter, because the biggest tick wins. And if you don’t see any ticks at all? Then you need to look further, because your best option isn’t in your current choice range.